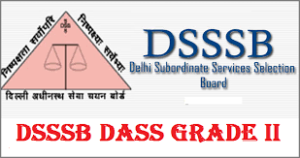 The DSSSB (Delhi Subordinate Services Selection Board) released the result for the Tier II exam that was conducted for recruiting Grade II DASS in the Services Department under the postcode of 40.2013. The Tier U exam was conducted on June 25, 2017, by the board, all the candidates who passed the Tier I exam were also in the Tier II exam. The results for the Tier II exams have been uploaded on their official website. All the candidates who took the exam can see the results by logging in their accounts on www.dssbonline.nic.in. The link of the e-dossier will be active on 9 February 2019 and will stay available until 18 February 2019. All the candidates who qualified in the Tier II exam are asked to upload their documents in the e-dossier before 18 February 2019. If the candidates fail to upload the documents they will be removed from the list. All candidates must make sure that they complete or fulfill all the eligibility criteria for the said post before the last date.